Our diamonds are Patent Cut. Regular diamonds have 58 facets and Shine On Diamond has 97 Facets. Read products description for more information on Shine On Diamond vs Regular 58 facet. 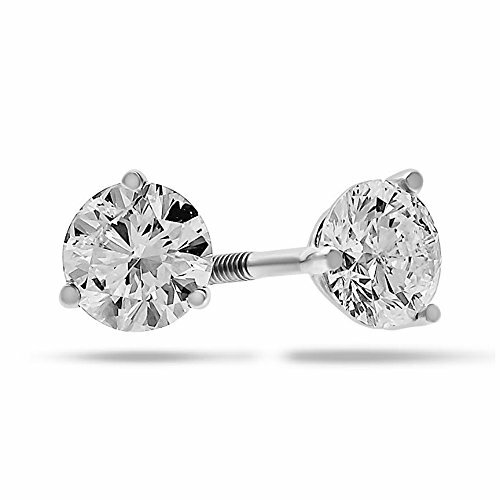 Stones are set in 3 prong 14k Gold studs with screw backs for extra safety. Studs are stamped with 14k SOJ on the post. Diamond cutting is done in our facility in New York, NY. Our products are set, polished and IGI Certified right here New York, NY. Our Jewelry comes with IGI NY Certificate of authenticity (J-K, I1) & Gemex Light Performance certificate which measures for its brilliance, fire and sparkle. Read Product description for more information on Gemex Light Performance certificate. All of our diamond suppliers state to the best of their knowledge that any diamonds supplied to Shine On are 100% conflict free natural diamonds. We offer 30 day money back guarantee for all our jewelries.